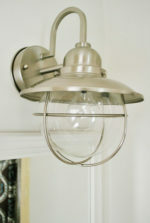 Builder grade light fixtures are utilitarian and intended to have a broad appeal. But after years of living with them, sometimes we DIYers wish for something different, something unique, that speaks to our individuality….well today’s post features DIY Mason jar lights that do exactly that! Lauren, over at blesserhouse.com has felt our pain. She got tired of the plain Jane mass appeal lights above her vanity and wanted to bring more of her and her family’s personality into the bathroom lighting. So her solution was to create DIY mason jar light fixtures. 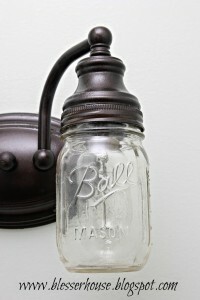 When Lauren decided to upgrade her bathroom lighting, mason jar decorating had become all the rage. You’d better believe that these old standbys aren’t just for canning fruits and vegetables any more: these versatile jars add a rustic touch to modern interior design and are being used in all sorts of crafty projects. 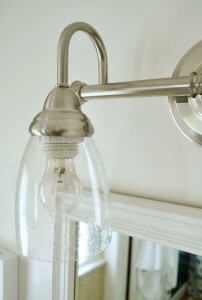 Never thought of DIY Mason jar lights for the bathroom before? 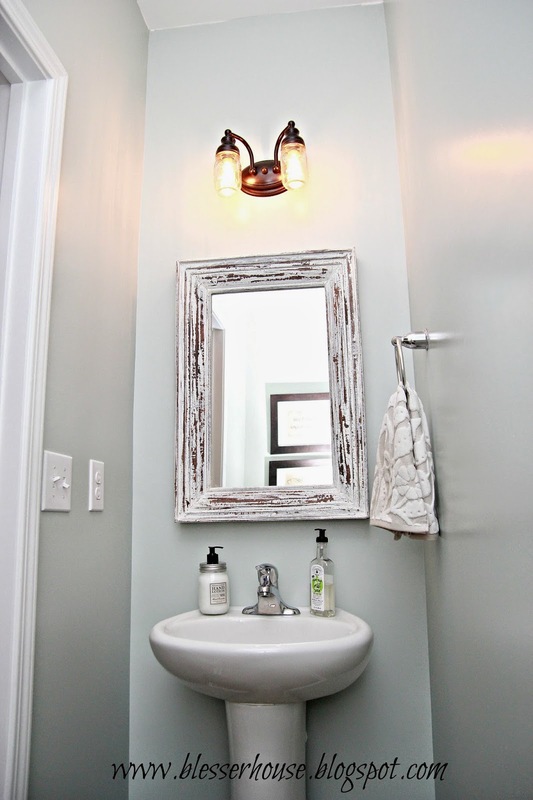 Just have a look here at Jessica’s budget project and follow her step by step instructions to create these great bathroom light fixtures. And boy, does she mean budget. Jessica estimated her total cost at around $6. Your mileage may vary, of course, depending on your taste and willingness to paint existing hardware. She was perfectly happy with the shape and style of the actual electrical fixture, just not the shiny silver finish. She opted to buy a can of her favorite oil rubbed bronze spray paint and to the work herself, you might choose to buy a new fixture in your desired color and finish, ready-made. 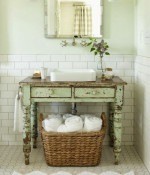 Jessica’s bathroom is small, and she opted to use small mason jars on her two light fixtures so as not to overwhelm the narrow vanity space. 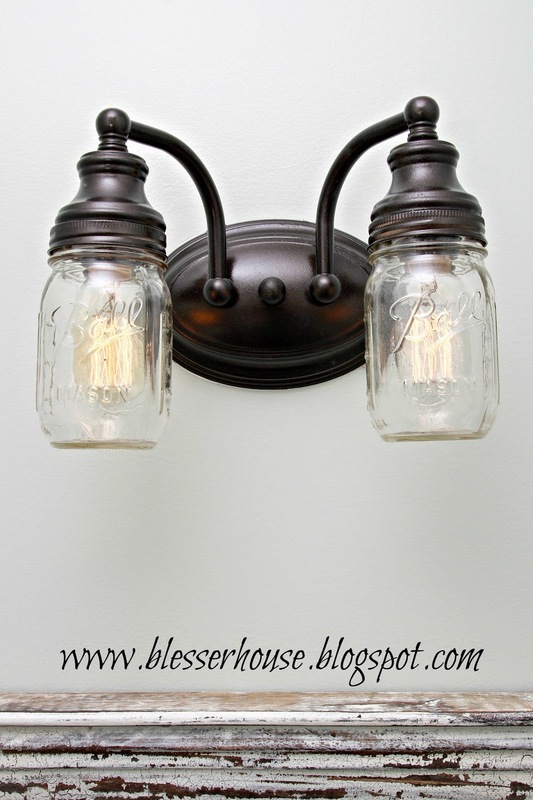 She adapted the jars to becoming light shades by cutting a circle (using a ball-peen hammer and a nail to do the job) in the Mason jar lid using the lighting fixture flange as a guide. She painted the Mason jar rings with the oil rubbed bronze paint and all that remained was re-assembly. The lid slides on to the bulb housing first, followed by the rings, both are secured in place by the fixture flange. Next comes the light bulb and finally, on goes the Mason jar itself and voila! A new rustic light fixture is born. Jessica opted not to use energy efficient regulation bulb in her updated fixture, but rather chose to preserve the retro effect by buying and using Edison bulbs instead. Be sure to check out this detail in her post, it is brilliant. While not as energy efficient, this is an immediate on/ immediate off light choice in a room that generally is not noted for long term light bulb burn. Most bathrooms you’re in and then you’re out, so the amount of extra electricity required by Jessica’s bulb choice is more than compensated for in other energy efficient choices in her home. The Edison bulbs also give off a brighter warmer light than the energy efficient CFLs, which works very well in this small vanity space.